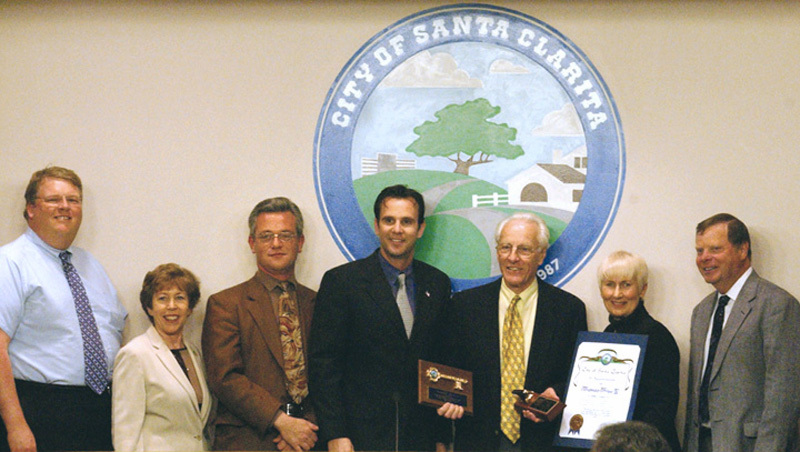 April 8, 2003 — Former SCV Historical Society President Tom Frew (third from right) receives a key to the city from the Santa Clarita City Council and a special award from the Society on April 8 upon his departure from the Santa Clarita Valley, where three generations of Frews made their home throughout the 20th Century. Tom's grandfather, Tom Frew II, arrived in 1900 and took over Newhall's blacksmith shop, and passed down the business to his son and, in time, to his grandson  "our" Tom, Tom Frew IV. Tom, who also served on the Newhall Redevelopment Committee since its inception in 1996, has moved to Ventura County, where he is a partner in a new nursery business. Pictured (from left) are Councilman Frank Ferry, Councilwoman Marsha McLean, SCVHS President Leon Worden, Mayor Cameron Smyth, Frew, Councilwoman (and SCVHS board member) Laurene Weste, and Councilman Bob Kellar. HS9019: 4800 dpi jpeg from tiff | Photo by Bryan Kneiding. Read: The Accidental Blacksmiths of Old Newhall.